It’s no secret: New York in the summer stinks. Most of the time, that overpoweringly unpleasant smell is coming from the garbage bags whose contents are slowly cooking, sous-vide style, in the sun. But if you’ve wandered the streets of North Brooklyn or the Lower East Side recently, you may have noticed a flash of gold peeking out from the rat castles that are our city’s trash piles. 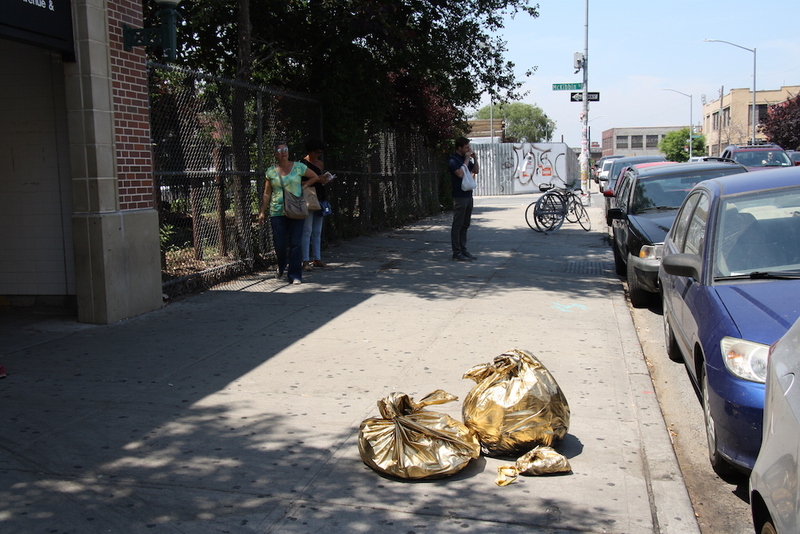 Those gilded bags aren’t the Department of Sanitation’s newest attempt at urban beautification; they’re the work of Peruvian-born artist Iván Sikic, whose new series “Trashed” aims to call attention to New Yorkers’ relationship with waste. Like Oscar the Grouch, New Yorkers are surly and we live in filth. But things might get a lot less trashy, thanks to a series of initiatives announced by Mayor de Blasio today. The city is set to expand graffiti removal, sidewalk power washing, litter-basket pickup, and highway ramp cleanup, de Blasio said.